Walnut rings Christmas cookies are easy to make and as you can see on the photo they are combined with another German Christmas cookie: Filled Honey Ring Cookies - Find the recipe for the Filled Honey Ring Cookies here - They are a nice addition for your Christmas Cookie Platter. Do you know that you can make vanilla sugar at home? It is very easy. 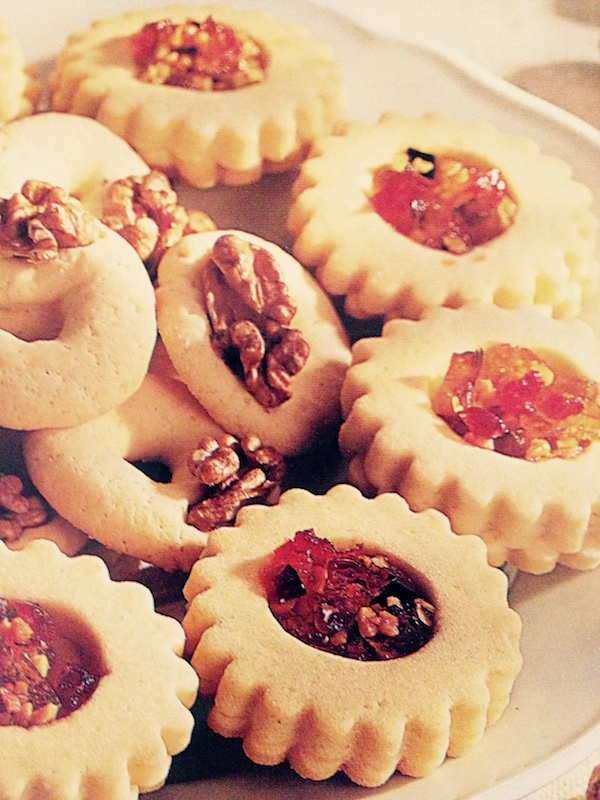 The photo below shows 2 different cookies; The walnut rings are on the left, the other cookies are filled honey cookies. Go to the recipe How to make Vanilla sugar - Happy Baking! - Mix butter, powdered sugar, vanilla sugar and egg yolks and beat until foamy. - Add orange juice and zest, heavy cream and Kirsch Schnaps. - Sieve the flour on top and knead until you get a smooth dough. - Make rings on a baking tray layered with parchment paper. - Place on each ring one half of a walnut. - Bake in pre-heated oven on 180 C or 350 F for 10-12 min. - Let cool off on a baking grid.